Jane, Digby and Scarecrow were going round and round about this Pete Stark thing and, in my opinion, Pelosi's dumb response. Whether she is overcompensating for blowing the Armenian Genocide move or something else is irrelevant. This sort of thing comes from the fact that they are wimps. I don't know how to describe it any better but that's the situation. They feel inadequate, lesser, weaker and so they act that way. This touches on some of the themes that we have been describing here at the Group News Blog and Sara more particularly over at Orcinus. To give you another example, in Democrats Abroad they have the same sort of wimpish behavior. The lawyer for Dems Abroad is just as big a wimp. We are forever told we can't do x or y because he doesn't "want to give the Republicans a stick to beat us with". It's silly. My instinct would be... Stick? are you kidding? I would rather walk up to the Republicans put the stick on the ground and say; pick it up. go on, put your hand on it. These people took over positions of power inside the Democratic party when the rest of us stopped being involved in party politics and we still have to drive them out. Its all the same type of person. 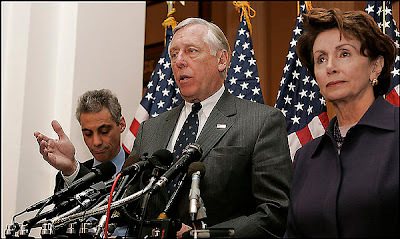 Pelosi, Hoyer, Emanuel , etc. They are only ever going to act tough with us. They are only ever going to curb our behavior. I know a little something about childish male power structures and the people who inhabit them, this crew will never step on the alpha's toes. Never going to happen. We need better leaders. Fortunately there is only a few of them left, a thin blue crust at the top of the toothpaste tube. Let's keep pushing.